Deceleration: Rate at which an object decreases speed. Agility: A rapid whole body movement, with change in velocity or direction, involving a deceleration followed by an acceleration, in response to a stimulus. Reactive Speed: The ability to switch from eccentric to concentric muscle contraction rapidly. Velocity: The rate of change of position of an athlete or displacement per unit of time, with respect to a specific direction. Linear Speed: Speed of a movement in a straight line. Speed Endurance: The ability to maintain speed over a distance. Newton’s three laws of motion help to understand how forces help create motion in the body. Newton’s First Law of Inertia: An object will tend to resist changes in their state of motion. An object in motion will tend to stay in motion and an object at rest will tend to stay at rest until it is acted upon by a force. A runner sprinting will want to continue that motion until a muscular force acts upon it to overcome inertia and slow down. Increased leg strength without increasing mass should result in a greater ability to create force when accelerating. Newton’s Third Law of Reaction: For every action force there is an equal or opposite reaction force. Forces interact within the body in equal and opposite pairs. As an athlete applies a push force into the ground with the legs the ground force reaction off the ground propels the athlete forward. Understanding the biomechanics in sprinting can help you understand the how and why the body moves the way it does. Displacement: A change in position of an object or change in a position of a body with respect to a particular starting and ending point, expressed in units of length. Work: The result of a force acting on an object. Work capacity: The total amount of work the body is able to perform, recover from, and adapt to. Force: A push or pull that changes to the state of motion of a body or body segment. Can be applied during a sprint start when accelerating, when slowing or stopping a body, or accelerating/decelerating while already moving. Muscular strength: The amount of force a muscle/s or group of muscles can produce when contracted or stretched. Mass: The amount of matter the body has. Mass is different from weight. Typically measured in grams or slugs. Weight: The amount force gravity exerts on a body. Weight can vary based on gravity but mass remains the same. Center of gravity: The assumed point at which the force of gravity appears to act. The point at which the total mass of the body appears to be concentrated. The center of gravity may or may not lie within the center of the body. Base of support: the area beneath a person that makes contact with the supporting surface. Balance: ability to maintain a line of gravity within the base of support. The ability of the athlete to maintain equilibrium. When line of gravity falls outside the base of support a reaction is needed to maintain balance. Static balance: Ability to control the body while the body is stationary or maintaining a fixed posture. Dynamic balance: Ability to control the body while moving. The ability to maintain postural stability and orientation with the center of gravity over the base of support while the body is in motion. Momentum: The quantity of motion an object possesses. Momentum can be transferred from one object to another. Linear momentum: Momentum in a straight line. Angular momentum: Rotational momentum created by different segments in the body. Gait: How you ambulate your limbs to walk, run, or sprint. Gait has three distinct speeds: walking, running, and sprinting. While walking the legs do the majority of the work to propel to body forward and the upper limbs and torso are primarily used for balance and stability. Use gait speed increases the legs still perform the majority of work to propel the body forward but the upper limbs and torso are also needed for propulsion, as well as continuing to provide balance and stability. Gait cycle: A full gait cycle begins when one foot makes contact with the ground and ends when the same foot makes contact again. There are two primary phases during the gait cycle the stance phase and the swing phase. Initial contact: The point where the foot first makes contact with ground. Loading response: The weight-bearing phase of the gait cycle, when the foot absorbs force. Mid-stance: The body is supported by one leg. Foot starts to propel body forward after absorbing force. Terminal stance: As the body is propelled forward the body passes over the support leg. The stance phase ends when the foot leaves the ground. Pre swing: Also called toe off, it is the moment the toes leave the ground and the swing phase begins. Swing Phase: The swing phase is the point in which the foot is no longer in contact with the ground and the opposing leg is recovering preparing to touch-down. The swing phase can be further broken down into early, mid, and late swing. Flight Phase: Only applicable when running. The period when neither foot is in contact with the ground. The swing phase is included in the swing phase. Walking gait becomes running after reaching a certain speed which is about 2.0-2.7 m/s. Jogging speed is about 3.2-4.2 m/s. Running speed is about 3.5-6.0 m/s and sprinting is usually above 6.0 m/s but obviously this will differ with specific athlete abilities. The distinction between walking and running happens during the gait cycle, when the phase of double support (both feet in contact with the ground), becomes a phase of double flight (neither foot in contact with the ground). When sprinting both feet will never be in contact with the ground at the same time. As speed increases each foot will spend less time in the stance phase. As sprinting speed increases the time spent in the swing phase increases, time spent in the stance phase decreases, flight time increases and the gait cycle speed increases. As speed increases the initial contact changes from being primarily rearfoot to mostly forefoot. As speed increases it is more important to pay attention to proper dorsiflexion, plantarflexion, ground striking, and the effect of different types of footwear. The distance covered per each running stride or the distance the center of gravity travels between each foot contact. The distance the center of gravity travels between the landing point and the point where ground contact is broken. The distance that the center of gravity travels in the non-support phase of the stride. The distance the center of gravity travels away from the landing foot. The time it takes to complete a full stride which consists includes, time of support and time of nonsupport. Determined by stride speed and angular velocity through the full range of motion. Duration of time the foot/feet are in contact with the ground. For short distance sprints up to 100 meter, leg strength is a better determinant of performance. The greater force the athlete is able to generate the greater the potential stride length as well as potential increase in stride frequency. For longer distance sprints 200 meters of more technique is a better determinant of performance. Elite sprinters spend much less time in contact with the ground than non-elite sprinters. Elite sprinters able to produce more force which allows them spend more time in flight than non-elite sprinters. It is not that they are moving their limbs faster through the air but the have greater stride frequency because they spend less time of the ground. 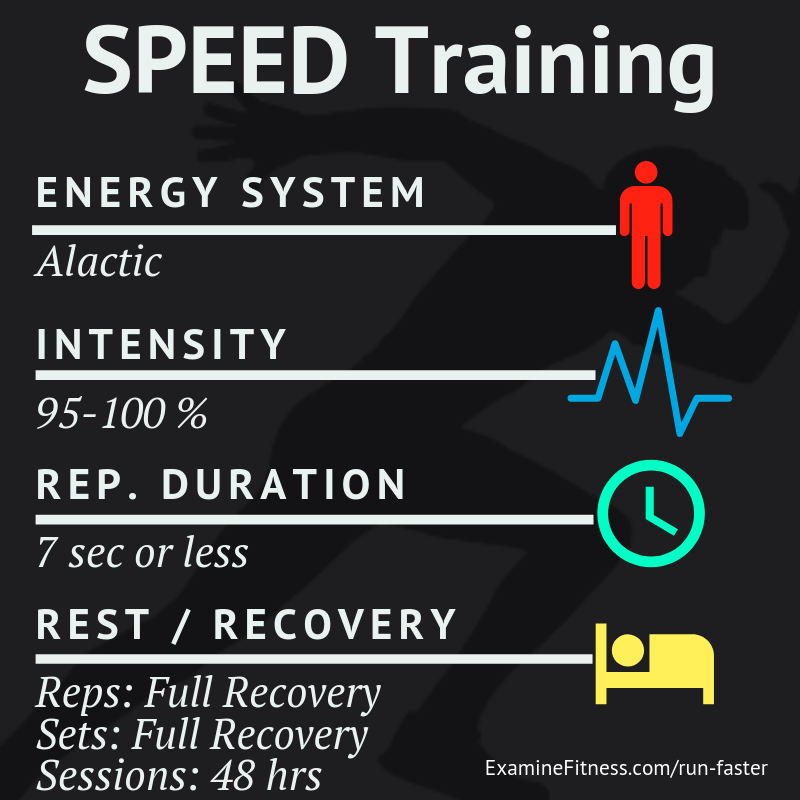 Speed work will encompass training the skill of sprinting and increasing the ability to perform work in alactic conditions which includes, technique for accelerating and mechanics for sprinting at maximum speed. All three points of focus should help the athlete become more efficient in alactic conditions. Alactic describes the primary fuel source for sprinters which is ATP-CP. Acceleration focused training will usually be performed from a standing position, in a three point stance, from blocks, or sport specific stance. The stance should mimic the acceleration mechanics the athlete is training for. The distance used will vary based on the athletes age and abilities. Younger, non-elite athletes will reach top speeds in shorter distances, approximately 10-20m. Elite level athletes may not stop accelerating until they reach 40-60m. When training acceleration athletes should be fully recovered between repetitions and performance should not decrease from set to set. Younger, non-elite athletes will recover faster between sets, approximately 1-3 minutes and elite level athletes may require up to 5-7 minutes. As the term describes, when training for maximum speed the objective is to reach maximum speed and hold that speed until it decreases. The athlete is working to improve their upright running mechanics. Maximum speed sets do not need to begin from a sprint stance or crouch but can start with a rolling or jogging start to conserve energy. The distance required to reach maximum speed will vary with athlete but will range between 10-40 meters, younger athletes will require a shorter distance while elite athletes will require longer. As with the run up distance the ability to maintain top will also vary. Elite athletes will be able to hold maximum speed for 10-30 meters while younger, non-elite athletes will only be able to maintain top speed approximately 10 meters. The rest interval between sets should allow for full recovery and be based on the total distance required for run up and maximum speed run. Younger, non-elite athletes may require only 3-5 minutes to recover whereas, elite athletes can require up to 15 minutes. The goal for race or sport focus should attempt to simulate the acceleration needed for the initial portion of the race or sport. This training should be focused on high quality technique and movement. The starting position should be replicated to mimic the exact race or event such as, a block start, standing start or a three point start. The sprints should be a maximum of 7 seconds. The rest interval will be highest during this training phase because of the very high intensity of the training. A young athlete performing a 40 meter sprint should rest 4-6 minutes between reps. Elite athletes running 40-60 meters can require 15+ minutes to fully recover. When training speed endurance the goal is to become more efficient sprinting longer than 7 seconds. The goal of the speed training work was to accelerate and achieve maximum speed now we want to improve the ability to maintain that top speed. Whereas, speed training work focused on training primarily in a zone where the alactic system provided fuel, training speed endurance will rely primarily on anaerobic metabolism. After approximately 7 seconds of high intensity sprinting most athletes are no longer accelerating, have reached top speed and the anaerobic system provides the majority of resources to continue contracting muscles. This is also when you start to feel the build up lactic acid in the body. Training speed endurance is focused on maintaining top speed, which will last 7-15 seconds. After 15 seconds almost all athletes will experience a reduction in speed. Training must be done running at maximum or very near maximum speeds and work to maintain top speed without any significant reduction in speed. Full recover is required between sets in order for the athlete to truly challenge their anaerobic system training speed endurance. If athletes are fatigued they will not be able to sprint with high quality technique, they will experience a high level of perceived effort and their ability to maintain proper mechanics/technique may suffer. As with training speed work younger, non elite athletes will recover faster than elite athletes because of the stress high intensity sprinting puts on the athlete. Athletes should be able to perform 2-3 repetitions before their speed and intensity declines. The distance required for training speed endurance will vary based on the athlete because of the distance they require to reach and maintain maximum speeds. The distance will usually range between 100-150 meters. The goal of training specific endurance is to optimize an athletes ability to run longer distances at sub maximal speeds. This type of training applies to runs that last more than 15 seconds. After accelerating and reaching top speed in approximately 7 seconds, an athlete is only able to maintain maximum speed to about 15 seconds. After 15 seconds even elite athletes will see maximum speed decline. Specific endurance attempts to train an athlete to maintain the highest sub maximal speed for the longer distances. Running mechanics and technique will also differ slightly when training specific endurance or on longer sub maximal runs over 15 seconds or longer than approximately 100 meters. During longer duration runs an athlete will have a greater focus on conserving energy, which usually expresses itself through less exaggerated arm action and more efficient technique that uses less range of motion. Distances during training will be longer than the specific race or event distance an athlete is training for. Distances will obviously vary based on the athlete and goals. The additional distance can be applied by adding additional meters or adding time to the training run. For example, a 200 meter runner may perform a 250-300 meter run or run an additional 30 seconds of work. A 400 meter runner may run 450-600 meters or run an additional 30-90 seconds. Full recovery is necessary to train specific endurance appropriately which means there may be a significant amount of time between repetitions. As with speed training and speed endurance training younger, non elite athletes will require less recovery time. Shorter duration runs will also require less time to recover between reps when applying the rule of 0.5-1.5 minutes of recovery time per second of work. Perceived exertion during specific endurance training may feel higher but overall it less taxing on the central nervous system than training speed endurance because the actual intensity is lower at sub maximal speeds. When training special endurance the objective is to achieve adaptations that differ from speed endurance and special endurance training. During special endurance sessions there is less of an emphasis on technique and a greater emphasis on applying particular stressors to the athlete. During special endurance training, the methods will vary. An athlete that is training for a field sport that involves short duration sprints, may work to improve work capacity by training their repeated sprint ability. The goal would be to improve the ability to accelerate repeatedly without significant performance losses from rep to rep. For longer distance runs an athlete may run the majority of the distance at race pace and practice finishing the final segment at a much faster pace then they are currently able to maintain for the entire length. Another typical special endurance workout called a split run breaks up longer runs into smaller portions with short rest intervals. The short rest intervals allow the athlete to run faster than they can run the total distance in a single set, while still challenging the lactic energy system. Split runs can also use distances that are shorter than race length that prevent the athlete from achieving maximum speed. An example of an athlete training to run 40 meters, would perform 4 sets of 3 repetitions, repeatedly run 30 meters, with 2.5-3 minutes of rest between repetitions and approximately 5 minutes of rest between sets. The duration of runs and rest intervals both vary when training special endurance. Training should be specific to the sport or race the athlete will compete in. The rest interval should not allow for full recovery the reps should be performed at 95-100% intensity. These training sessions will improve endurance capabilities for short duration sprinters. Low to medium intensity runs may be used to train at less than 95% intensity, to target specific energy systems, increase work capacity, or as active recovery sessions. Intensive tempo training is primarily used to improve efficiency of the body to perform under lactic conditions. Intensive tempo training intensity ranges between 75-95% intensity. Training in this modality does not replicate the intensity or the biomechanics used in short duration sprints but does help to prepare the body for sprinting 95-100% intensity. Rest intervals between repetitions should not allow the athlete to fully recover, they should be relatively short. They short rest intervals result in a build up of lactate which increase the perceived effort of training but the actually intensity is not as high as speed training. The training runs should work on keeping a similar pace and rhythm or tempo throughout the workout. The focus should be on stressing the lactic energy system with a relatively high volume of work at a moderate intensity that is high enough to stress the central nervous system. Extensive tempo training is similar to intensive training but the major difference is that extensive tempo training avoids the build up of lactate and hydrogen ions. The training primarily is performed aerobically, using oxygen as the primary fuel source. During training the athlete should feel out of breathe but not the pain you may feel from lactate build up during higher intensity work. Although the speed during low intensity differs it can be used for active recovery sessions. It will help an athlete circulate blood and work out tight muscles. During extensive training the perceived effort may feel high but the intensity is low and the effect on the central nervous system is not significant. Distances will vary but despite the distance the runs should be performed at conversational pace or an intensity below 75%. Resistance speed training can be done a variety of ways. The purpose of training in this manner is to apply specific stressors to the lactic and aerobic energy systems. Resistance can applied in many ways the simplest way to apply resistance is with hills but other methods include, using sleds, or bungee systems. During assisted or over-speed training the objective is to achieve speeds you would not typically be able to reach under normal conditions. The most common forms of over-speed training are running down a slight gradient or using a pulley/bungee device. The key to running down hill correctly is finding an appropriate hill to training on. The hill needs to have a smooth surface, appropriate length, and most importantly the gradient needs to decrease slightly. A hill that is too steep can put excessive stress on joints and muscles. A hill that has just a 5 degree drop will cause an athlete to drop almost 15-20 cm per stride. Because it can be very difficult to find an appropriate hill, a pulley option may be a better way to control variables. Although you can control variables you still need to pay very close attention to how the body is being loaded and make sure there is no over striding, which can lead to injury. Goal: Develop an athletes overall fitness and level of work capacity, which includes running, weight training, plyometric, and neuromuscular development. Improve stability through general strength and ancillary exercises. Lack of vertical translation of c.o.g.